I hope you all had a wonderful summer! Here at Groundwork Lawrence we had our busiest summer to-date and we have lots of updates for you below. We're looking forward to a busy fall with the Groundwork USA annual conference, our Farmers Markets concerts, the Spicket River Cleanup on September 24th and we are already selling tickets for our Annual Glow Gala on November 17. Are you an (aspiring) artist? The Call for Eco-Art is ready and available online. We hope you enjoy our latest newsletter and will join us at one of our many events in the coming months. Thank you for your support and please keep in touch by email or stopping by our new office on the 3rd floor of 60 Island St.
GWL Green Team was busy this summer working on a number of projects from their social entrepreneurial venture, Keepin' It Fresh, through which Green Team members have been cultivating fruits and vegetables in community garden beds and sell to a local restaurant, Cafe Verde, and Ranchero Market, to creating a healthy eating presentation and sharing it with other youth in Lawrence, to filming their very own documentary! We have wrapped up the summer program and Green Team is starting to plan for our annual Spicket River Clean Up, Sept 24th. We're also very excited to be taking two of our Green Team members to Colorado this month for the Groundwork USA annual youth summit. We can't wait to share our work with Green Teamers from all over the country and come back with new ideas and inspiration to put into action here in Lawrence. For more on the Green Team, including their summer 2011 Newsletter and to view the documentary and Public Service Announcement they created this summer, check out the Green Team page on our website. Join us for the 10th Annual Spicket River Cleanup! We hope you can join us for the upcoming 10th Annual Spicket River Cleanup. Over the last 9 years over 5,000 volunteers have removed over 100 tons of trash and debris and over 2,000 tires from the river. We are expecting over 500 volunteers this year, but there is always room for more. Let's make this cleanup the biggest event ever (which means we need to beat 845, the number of volunteers that participated in April's Earth Day, Comcast Cares Day!). 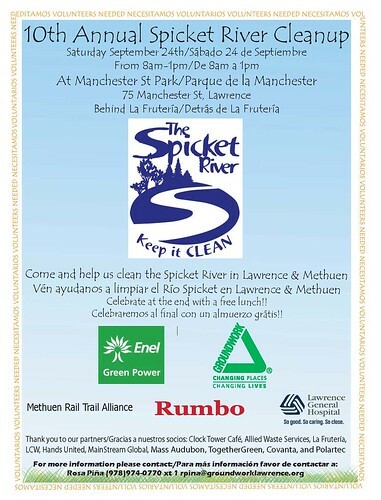 This year our neighbors, the City of Methuen lead by the Methue Rail Trail Alliance, are joining in and we'll be cleaning up few sites further up river. Starting at noon, to thank and celebrate our volunteers' effort and hard work, we will have a free BBQ lunch. More information and the waivers are available online or please contact Rosa Pina at (978) 974-0770 ex 1 or for more information or to register a team. Thank you to our lead sponsors: Enel, Lawrence General Hospital and Rumbo and to our event friends Clock Tower Cafe, Allied Waste Services, La Fruteria, LCW, Mainstream Global, Mass Audubon, TogetherGreen, Covanta Energy, and Polartec. $1 per day per family member to be redeemed for fruits and vegetables at the Lawrence Farmers Markets throughout the market season. We have also been able to pilot a swipe gift card program through funding from Project Bread and support from the Federation of MA Farmers Markets.We are distributing $5 and $10 gift cards through the local DTA office, at our Healthy Living workshops, and through GLFHC, Project Impact and other partners. We'd like to thank our market sponsors the New Balance and Bank of America foudnations. In addition, through generous funding from the White Fund and the Pringle Foundation we are excited to be offering live music from local artists at both our markets.Visit our website for a full list of performers. Hope to see you there! Groundwork Lawrence, in partnershp with the City of Lawrence, has been working on the construction of the Spicket River Greenway for over ten years. We are excited to announce that construction has started on the $3M project that will build a 2.5 mile linear riverfront park. The Greenway will make improvements at 6 existing parks and create 2 new parks. The design of the Greenway incorporates rain gardens to remediate stormwater and provide extra flood storage capacity. 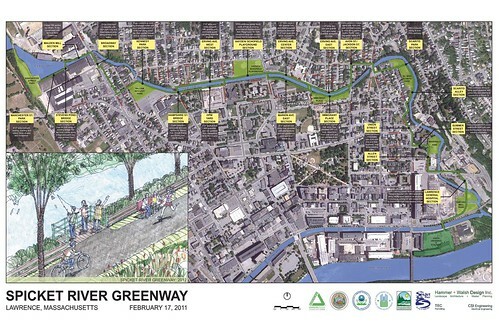 The connectivity provided by the Greenway will create safe recreational opportunities through the Arlington and North Common neighborhoods, connecting Manchester St. Park, Stevens Pond, and Malden Mills to Central Catholic, Mary Immaculate, Lawrence General Hospital, the new park at the Oxford Paper site, to Union Crossing, the Merrimack River, and the commuter train station. We are quite excited to make this community vision a reality. Groundwork Lawrence has also completed designs with the Massachusetts Division of Ecological Restoration to complete terrestrial and aquatic habitat restoration. We plan to begin implementing revitalization plans this fall by removing invasive vines in the fall and installing random boulder clusters in the spring to improve in stream habitat in the fall. Using volunteers to implement these projects will help raise awareness about the Spicket, an often overlooked urban river. Thank you to the Commonwealth for funding the greenway through the Gateway City Parks, Coastal Zone Mangement, and DCR Receational Trails grants and to the City of Lawrence for providing the required matching funds utilizing Community Development Block Grant funds. Urban Adventures - Summer Fun in the City! The Urban Adventures Summer Program kicked off its inaugural summer with a trail-hiking, bug-catching, nature-lovin' bang! The camp, which was created in partnership with Mass Audubon, introduced 37 Lawrence children to the beauty and fun of urban ecology. The campers, age 6-13, explored the natural spaces of Lawrence through themed activities and games. Each day was filled with a new adventure, from scavenger hunts in Manchester Street Park to gardening at Leonard Middle School and from bug hunting at Nina Scarito Park to wildflower picking at Den Rock Park. 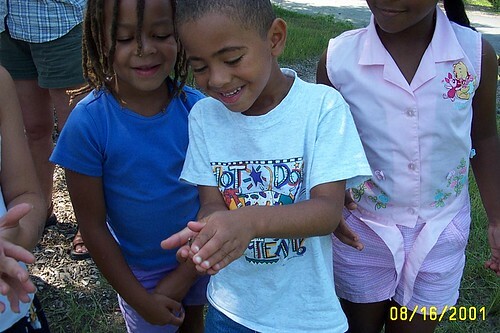 Campers were constantly amazed by the beautiful and intriguing creatures they discovered on their adventures. One camper said, "I didn't know Lawrence had so much nature! Now that I do I think it's cool." We'd like to thank Cambridge College for the use of their excellent facilities. 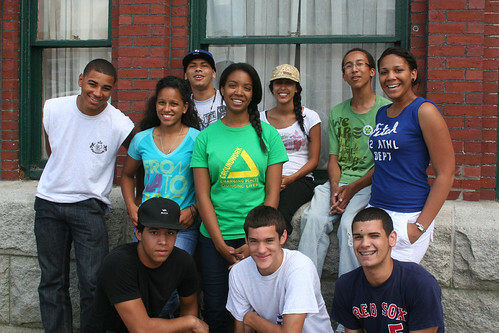 Our appreciation goes out to Boston LISC for providing AmeriCorps members who served as staff. Thank you Bank of America, Essex County Community Foundation, New Balance, the Forest Foundation, and the Amelia Peabody Foundation, whose generous grant support allowed 97% of our campers to enjoy this six-week program for reduced or free costs to their families and enabled us to hire local young adults as Junior Counselors. We'd also like to thank the Lawrence Public School District for the summer meals program. We'll be hosting nature camps during school vacation and next summer. For more information on the Urban Adventures program or to register your child, contact Nia Keith at nkeith@massaudubon.org or at (978) 974-0770 ext 8. We had a successful spring, expanding our existing schoolyard garden program from 2 to 4 garden sites. We currently operate garden programming at the Leonard Middle School, the Tarbox Elementary, the South Lawrence East Middle School (SLEMS) and the Boys and Girls Club. We developed and implemented an 8 week garden curriculum in partnership with Mass Audubon through the Leonard Middle School Wrap Around Program, which we hope to continue into this fall and expand to other schools. This summer we continued summer programming at the SLEMS and Boys and Girls Club, helping them to maintain their garden spaces and learn about basic plant and soil biology and healthy eating. The Summer Stewards group of the Urban Adventures summer program helped us to maintain the garden at the Leonard school. Green Team presented their healthy eating workshop to the SLEMS' Dirty Hands Club, which they loved. Thank you to the New Balance Foundation and Essex County Community Foundation for supporting the gardens. We hope to continue to expand the program and offer resources and programming to more schools in Lawrence. If you are interested in programming or helping to fund the the scholyard gardens please email Anna or call her at 978-974-0770 x4. We're right in the middle of the harvest season and the Farmer Dave's fresh fruits and vegetables grown right down the road in Dracut are tasting better than ever. As we have for the past 5 years, GWL and Farmer Dave's have partnered once again to bring a Community Supported Agriculture drop off location right here in downtown Lawrence. 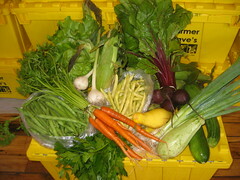 This year we were able to expand our Share-a-Share program, historically only offered to Lawrence residents, to all of Farmer Dave's 12 drop-off sites allowing for anyone participating in the CSA to pay with SNAP (food stampt) benefits, utilize a flexible payment plan, and have access to share subsidies. We have been able to accept SNAP benefits for 13 shares, and were able to offer over $9600 worth of subsidies across 7 different communities for a total of 44 subsidized shares, including 5 super family sized subsidized shares between Neighbors in Need, a local network of food pantries, and Team Coordinating Agency, a network of adolescent residential treatment homes in Haverhill, Wilmington, and Bradford. Thank you to all our CSA members as well as those whose generous donations and allowed us to make sure a huge impact through our extended Share-a-Share program this season. We also want to thank Project Bread for its going support of our work to make fresh food affordable and accessible. It's not too late to sign up for a pro-rated share or the late fall share, click here for more info and to register online. The number of community gardeners participating in the community garden network doubled this summer to over 250! Groundwork Lawrence, working in partnership with the City of Lawrence, converted five vacant publicly owned lots into 3 communtity garden sites providing space for growing fruits and vegetables. The lots were previously dumping grounds for trash or overrun with invasive plants like Japanese Knotweed, but now they are sources of pride for the neighborhoods -- often inspiring landowners to make improvements to their own properties. 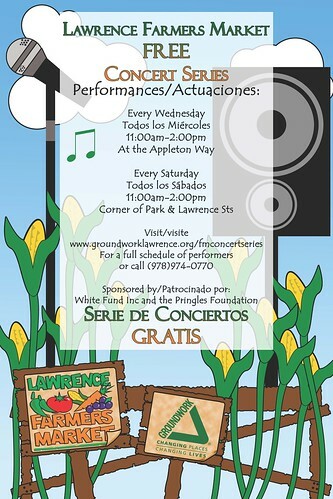 Funding for the gardens was provided by the Commonwealth's PARC grant and the City of Lawrence provided additional funding using Community Development Block Grant funds. Groundwork Lawrence provided project management and design services for the project. Currently, we oversee the management of the gardens and provide a range of educational opportunities for the gardeners. This fall we look forward to partnering with the Farm School to build a green house, tool shed, and complete permaculture plantings. We are also looking forward to building a high tunnel to extend the growing season through the winter. As you can tell, the City of Lawrence and GWL have been working hard on open space improvements throughout the city! GWL just completed project management of improvements at the Howard Playstead little league baseball complex. The new lights and scoreboards will enable the league to host major tournaments and expand the league's offerings. The park's concession stand is going to be a huge draw for spectators and provide much needed resources to the league. Boulders from the foundations of old mill buildings were re-used as seating for the concession area. One of the project's highlights was a tree planting project in which the neighborhood and baseball players planted eight trees throughout the park. One young participant was amazed by how much fun she had planting the trees and enthusiastically asked if we could do this every week! This brownfield is part of Lawrence's gateway project, which is a significant part of the city's economic revitalization strategy. Continuing our role that started with the Riviendo Gateway Initiative, GWL has provided design reveiw services to the city during the development of this important project. Once construction begins GWL will provide construction administration services and oversee habitat restoration plantings. The new park be a major addition to the Spicket River Greenway and will become an anchor for new residential and commercial developments in mill buildings adjacent to the site. 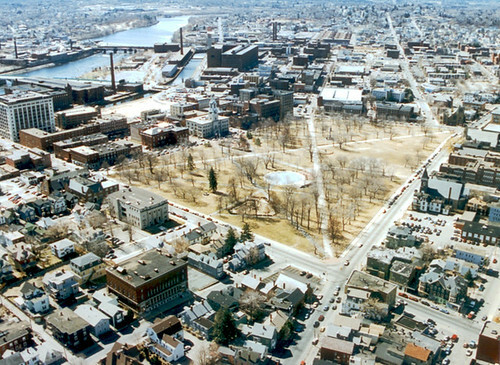 In 1848 the Essex Company donated 17 acres of land to the City of Lawrence to be set aside as the North Common. To protect this historic asset, the Common was added in 1979 to the National Register of Historic Places. Today, the Common is known as the Campagnone Common and it is one of Lawrence's most used, recognized and loved parks. Lawrence residents and officials have for years dreamed about what renovations to the Campagnone Common would mean. While there are many opinions as to the nature and extent of what enhancements to the Common would mean, all opinions meet in one place - the overall condition of the Common needs to be improved. GWL, in partnership with the City, and funded by a Land, Water, and Conservation Fund grant matched with Community Developmetn Block Grant funding, is overseeing a project team responsible for preparing construction documents for the first phase of the Campagnone Common improvements. This includes updating the lighting fixtures with historically appropriate and energy efficient LED light fixtures, drinking fountains, restoring the tree canopy, and adding new benches and tables. To help the City of Lawrence prioritize the next phases of improvements, we conducted a public outreach campaign that involved key informant interviews, public radio call-in shows, and two public meetings were attended by over fifty people each. Through these meetings an advisory committee has been created with the goal that it will support the future stewardship of the Common. I told you we've been busy! Please watch for our next newsletter to learn about our new MassLIFT AmeriCorps members, more details about the Glow Gala and new partners and projects!